NASB – … will not be disturbed. NIV – … will never be stricken with panic. NRSV, NET – … will not panic. JPS – … need not fear. As you can see, the translators were trying to make better sense out of the word here because there is some awkwardness in the original “haste” within the context of the rest of the verse. I think the general sense of the verse is something along the lines of “God will protect Zion and those who trust in God (who live in Zion) will not have to flee because Zion will be kept safe.” The preceding verses talk about those who place their trust in evil and “death”, so either you trust in God or you trust in death, to keep you safe (Isa 28:15) – the issue in question being the source of their safety. Okay, I think to myself – this looks interesting. First of all, Paul introduces this “a stumbling stone and rock of offense” which isn’t in Isaiah – maybe he is paraphrasing the text to draw a parallel between the “stone for a foundation, a tried stone, a precious cornerstone, a sure foundation” to a Christological reference (Psa 118:22). Then there’s the change of “will not act hastily” to “will not be put to shame”. While I can appreciate that Paul might have been playing loose with the idea of “As it is written”, it should be quite clear that these two changes alter the meaning of the text significantly. In Rom 9:33, the general sense is something like “God has appointed his stone that many will reject, but those who do not reject him and believe in him will be vindicated (not be put to shame).” I do agree, however, that at the most practical level, this probably isn’t a deal-breaker. From an academic point of view, however, this was very interesting and was worth investigating more. Therefore thus saith the Lord, even the Lord. Here we see how Paul got the “will not be put to shame” bit but there is no “stumbling stone and rock of offense” in the LXX, which I think we can just attribute to his paraphrasing (I really don’t want to get into a speculative debate about Paul’s motives and sources here.) My interest here is to discover why the LXX translators made the change from “will not hasten” to “shall by no means be ashamed”. Initially I wondered if the LXX translators might be doing what our English translators were doing, trying to make the sense of Isa 28:16 clearer and using a more dynamic translation instead of a literal one. The problem is that “ashamed” makes the issue one of vindication rather than security/safety that the original “hasten” implies. If it was a dynamic translation, it’s a pretty bad one contextually speaking. Then I started to look at the Hebrew text again. The Hebrew word translated “hasten” is יחישׁ (Hebrew:yachish) and one of the Hebrew words that is translated “ashamed” (Isa 29:22) is יבושׁ֙ (Hebrew:yevosh). 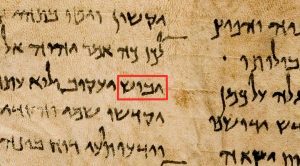 When I saw this I thought, “Wow, those two words sure look the same!” – the main difference being only in one alphabet, the ח (chet) and the ב (bet) because the difference between the י (yud) and ו (vav) can easily be mistaken in handwriting. I thought it might be interesting as an academic exercise to try to figure out which was the correct text. We know that the LXX translators did their work around the 3rd century BC. 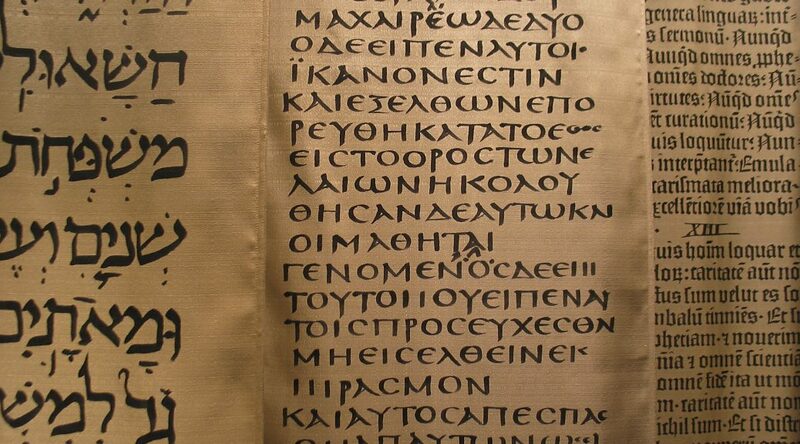 Our OT text is based off the Aleppo Codex, a Masoretic copy produced in the 10th century AD. Although much “younger”, it is considered the most reliable and accurate copy of the OT Hebrew text in existence (even more accurate than the DSS) for reasons that I can’t go into in such a short post. In any case, I felt I needed an older witness besides the Aleppo Codex to verify who got it right. As it happens, among the Dead Sea Scrolls are various fragments of Isaiah (4Q60 etc.) and a complete scroll of Isaiah (1QIsa). This scroll is kept in the Shrine of the Book in Israel and the actual manuscripts have been photographed and put on line, which was great news for me! While the DSS were written around the 2nd century BC, the sources would have dated even further back and so we have a source that is over a thousand years older than the Aleppo Codex. So what does the Great Isaiah Scroll say in Isa 28:16? It says “hasten”. This means that it is unlikely that the LXX translators had a copy that was correct and everyone else got it wrong. More likely, the translator made a mistake in reading the text, or that the copy he was working off had a copyist error. This is what the DSS Great Isaiah Scroll for Isa 28:16 looks like. The red box highlights the word “yachish” (hasten). 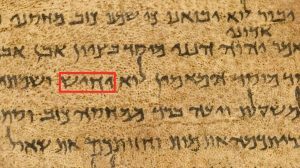 This is Isa 29:22 from the same scroll where I have highlighted the word “yevosh” (ashamed). It is easy to see how a mistake might have happened, and why reliance on the LXX poses particular problems when these errors are inherited by the NT writers.